Standing on any major milestone, some of us may gaze on the next mile, most of us will look back to see the stretch of our journeys thus far, reveling at how our own two feet have tread upon gravel, sand, mud, and mire to get to where we are: a place for breath. Almost never, however, do we give thanks for the gravel that put blisters on our feet so our soles would not be rubbed raw and open. Almost never, however, do we celebrate as we walk on the sand which gives strength to our legs first by depleting them. Almost never, however, do we give due credit when we are taught the meaning of examining our steps when we slip and fall in the mud. And almost never do we stand amidst the stench and slime of the mire and know that we cannot help ourselves. Always, we unlearn the wisdom which whispers that stillness is what we needed in order to hear the sound of help all around us. My food fairy of a mother flies over from the light-jacket-weathered West Coast, and the first weekend in here in Winter Wonderland Waterloo, she insisted that she wanted to go to the market and buy twenty pounds of chicken legs. And twenty pounds heavier was the car when it pulled back into our parking spot, and we hauled the suspiciously bagged mass of dismembered poultry limbs up to the third floor. As soon as the bag was set in the kitchen sink, she went merrily to work. I assure you, this is the first time I’ve ever seen her so comfortable around carcasses. She washed them one by one, patted them dry, and rubbed them with rice wine. Then in the wok, she toasted the peppercorns with the salt, waited for it to cool, then applied that to the chicken too. Then things got a little crazy – I became an accomplice in her act. I helped her make the cardboard coffin, lined it with a black garbage bag, and placed a steel rack in it. Then, one by one I carefully placed the chicken legs, skin side up, onto the rack. Once that was over with, I carried the whole box out the door, and left it on the deck. The wind was a bone-splitting -20 degrees, and the sun deceptively cold. And in that weather sat the chicken legs for seven days. On the seventh day, I flipped them over. And they stayed like that for another seven days. At last, they had finished curing, and winter has served its duty in this household. To make the cured quarters, follow the story above. Obviously, nobody in their right mind would attempt to devour twenty pounds (or should I say ten now that they’ve thoroughly dehydrated) of chicken – however delicious they may be – in one sitting. No worries, that’s what we have Ziploc bags for, then throw them in the freezer (or back outside if it’s still below zero). Now, when you want some really good chicken claypot rice, take out one bag to defrost, and keep on reading. Maybe I’ll give you a few incentives as to why you want to eat that chicken that’s been banished out along with Elsa for two weeks. Yes, it looks all dry and dusty, but once you steam it directly on the rice, you’ll taste and understand. The texture of the meat fibers becomes firm, yet supple, like that of a giant seared scallop. 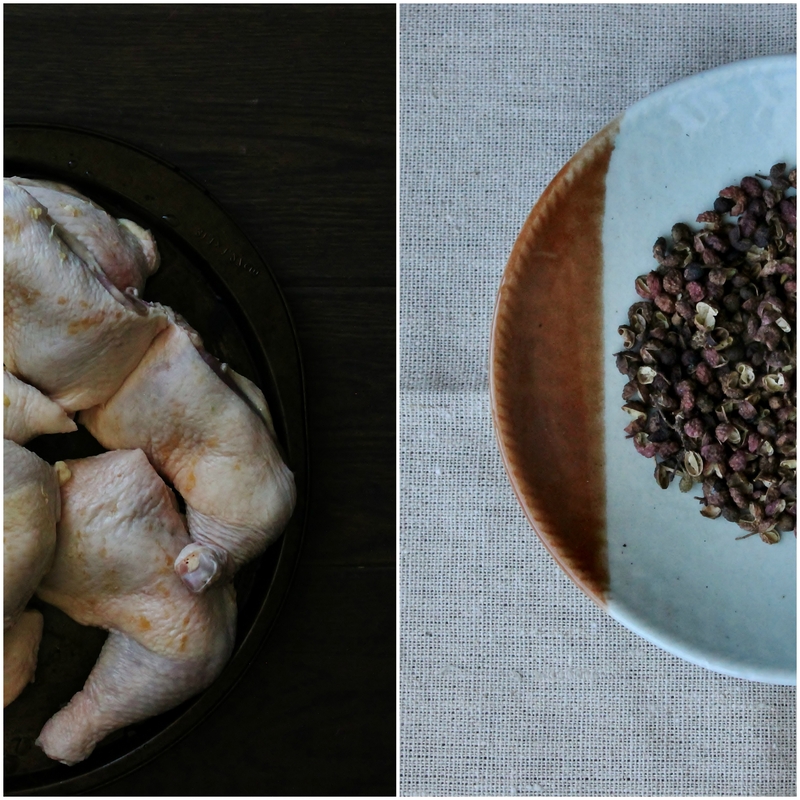 The flavour of the bone marrow and peppercorn-infused chicken fat renders into each grain of rice. The salt which permeates throughout the sweet flesh is transformed into a condensed form of umami with the creamy aroma of rice wine. To make the chicken claypot, rinse the rice in WARM water for three times, draining after each rinse, until the water runs clear. Put the chicken in a small clay pot or ovenproof ceramic vessel. Add the water and the ginger slices, then place the chicken, skin side up, directly on the rice. Put the clay pot in the rice cooker**, and pour a cup of water in the rice cooker (not the clay pot), and cook until the switch springs back up. Let it rest for 10 minutes, then repeat this step. Once it’s done resting a second time, sprinkle on the scallions, and dig in! 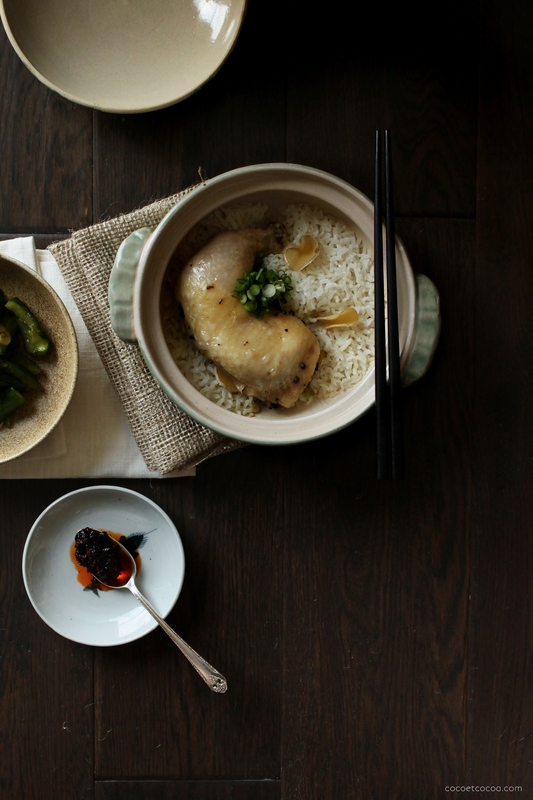 Enjoy with these sweet, garlicky pickles, and you’ll never want to go out for Hainanese chicken rice again. **If you don’t have a rice cooker, do it on the stove top! Place the deep ceramic dish in a heavy-bottomed pot, fill the pot to 2/3 inch with water. Cover the lid, and steam on medium high heat until the rice is cooked through, add more water to the pot as necessary. I am very curious to try this recipe when winter comes back to Minnesota, and I have a garage at subzero temperatures at my disposal. 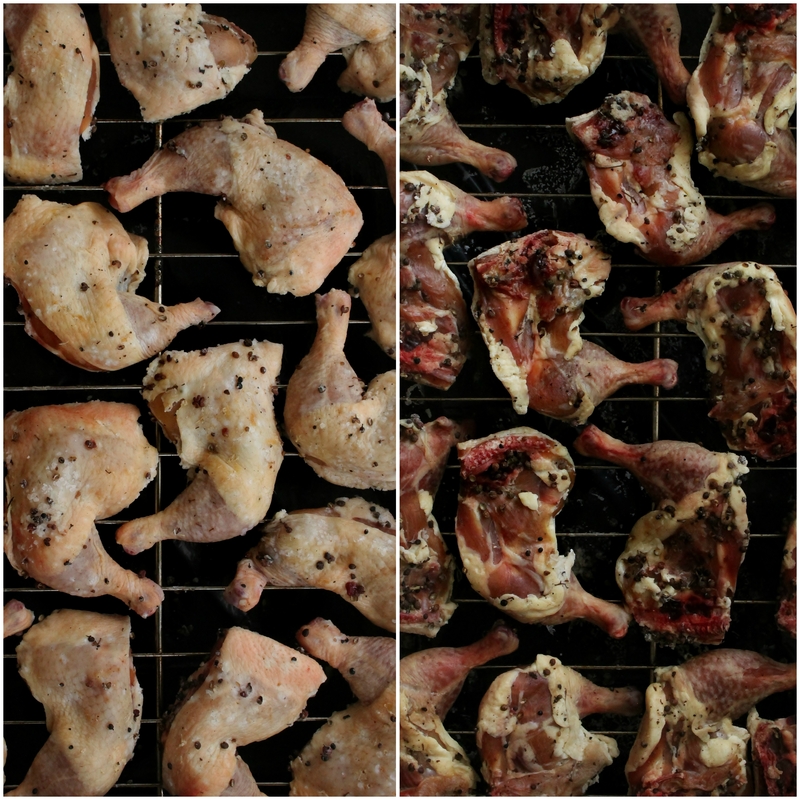 Do you cover the chicken while its curing, or do you leave it exposed to the air? Thanks for posting such a unique recipe. You’re welcome! Nope, I don’t cover the chicken because that way it dries out quickly enough and doesn’t get the chance to spoil. Also, if you’re thinking that winter’s a bit too far in the future, feel free to do the curing in your refrigerator, though it will take roughly twice the time. All the best to your delicious endeavours!